Hi lovelies! Hope you are all having a good Monday. I didn't have to work in rl so I'm happy about that. I decided to check out The Dark Style Fair early preview recently. Got a few of these awesome items at it! This is a new shirt by my friend Gretchen who owns [Fetch] available at the fair. It's so cute! I love the cut on the back of it shows some skin but covers your lady parts in the front. I decided to go with red cause this shade was totally inspiring my outfit. I also picked up these cute shoes from a new to me store called L'Emporio also available at the fair. I didn't show the front of them but they have this cute little heart locket attached. It also comes with a HUD you can change the texture of the soles/platform part along with the metals. I couldn't resist cause I love anything with hearts on it! Be sure to check out the fair lots of dark and cute styles at the fair tons for woman but also a ton for men as well. Have a great week loves! Necklace - Tattoo Choker Necklace (Deathly) BLACK by REIGN. Hi loves it's been a long time since I've blogged! Real life has been quite busy along with SL. But I'm gonna try and get back into blogging here and there when I have some free time. Hope you enjoy this post featuring many new items from the current round of The Epiphany. 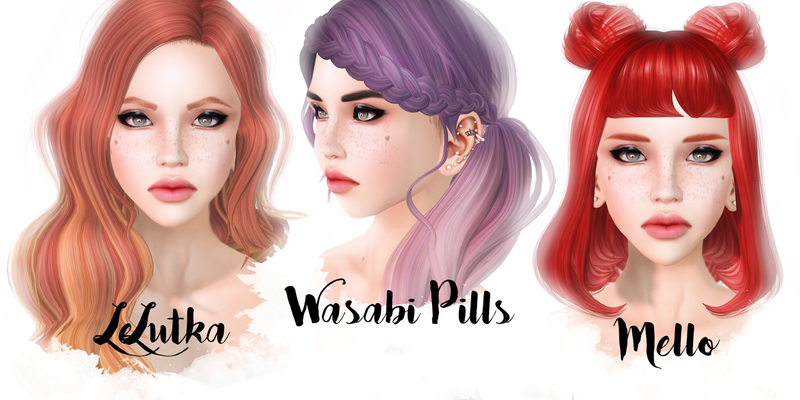 Be sure to check out the round so many awesome designers and gacha sets! Hair - Flower - Variety Pack by Lamb. I hope you guys are enjoying Hair Fair so far this year! I'm back with some more previews of hairs for you! Another release from LeLutka they did so great at this years fair. I love this one because its got that wavy vintage look which makes it look so cute and classy. Wasabi Pills came out with some amazing styles at the fair this year as well. This one is one of my favorites I love the braid side pony look all curly. I will admit I don't wear their hair as much as I should but their releases at the fair were by far some of my favorites. Mello is a new hair store for me. I had never heard of them until recently this past month and was happy to see them at Hair Fair! This short buns on top style is super cute so I couldn't resist grabbing it. Looking forward to seeing them grow as a store. Don't forget to stop by the fair before it ends on July 31st! I'll have lots of more previews up until that time. Happy hair shopping! 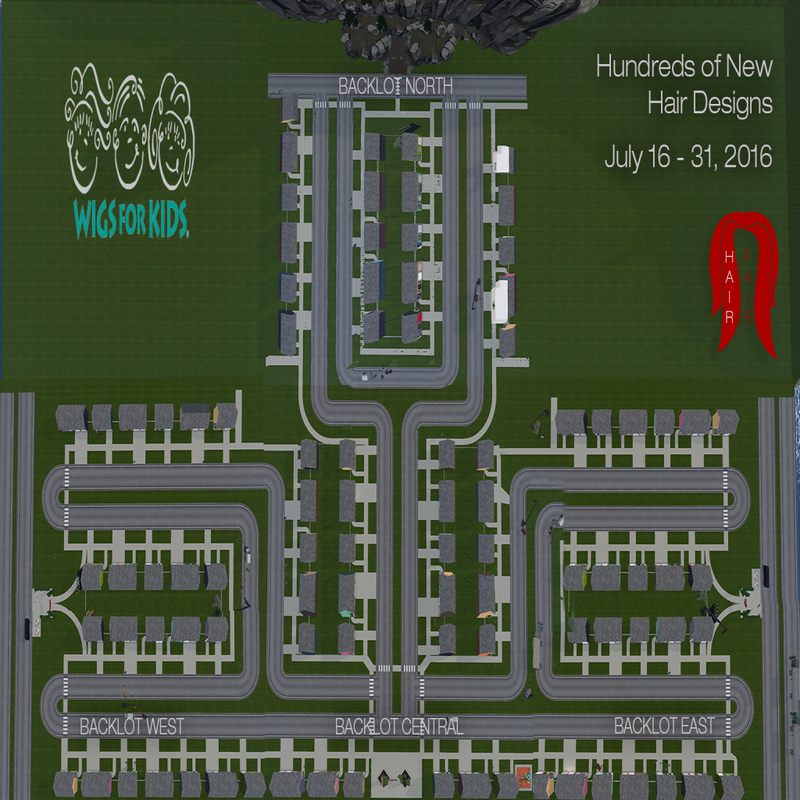 Hair Fair 2016 is now open as of today through July 31st! I'll be showing all kinds of new releases and hair styles out at the fair this year! This is by far one of my favorite years I spent so much money at the early blogger preview! With these blog posts I'll be focusing on blogging only the hair styles. If you would like to know certain details you can look at previous blog posts as most of the items I wear daily and have blogged or you can contact via my details on my contact page! LeLutka knocked it out of the park this year with their releases. I went home with at least 2 of them! This first one is one of my favorites which comes with a braid pony style. I love how elegant but casual it looks! enVOGUE is a fairly new to me hair store. Their styles this year are all really cute! I love ontop hair bun styles so I couldn't resist this one with the bangs it reminds me of some other older hair styles I used to wear all the time! MURRAY is known to me for their clothing but I had no clue they made hair as well! All their releases for the fair are really well done. I don't usually go for one side hair cause I always find them making me look weird but this one is gorgeous! I hope you guys enjoy my first preview of hairs for you! Tons more to come this week and the following! Hair Fair 2016 is starting soon July 16th - July 31st! This has always been one of my favorite fairs every year since before I can remember. Now that I've been trying to get more into blogging this year I was so excited to be accepted as an early access blogger to be able to shop around and check out the fair before it opens! Lets just say I went a bit crazy and bought so many hairs I can't wait to show you guys! While you are waiting to fight the lag or unable to get into the fair this week please be sure to join their inworld group for free demos from all the designers in the fair so you can pick out your favs and make a list before you visit! Cause what's more worse than trying to put on hair when your lagging out bald and unable to attach! I'll be blogging a ton throughout the fair to show you all my favorite styles for this year! Check out all the info on the event below and don't forget its all for a good cause with all purchases donating a percentage to Wigs for Kids. Hi everyone! I decided to do a quick blog post together inbetween working on other stuff inworld. Oleander released this hair Friday with special huds for flf. I adore this hair I can't remember if I owned it before or not already but anyways the huds for the event are wonderful so my heart is happy. Vintage Fair is currently going on and this new romper I'm wearing is from Cynful. It comes with tons of different options for changing things on the romper for textures. Be sure to pick up the fatpack it's totally work it, its so cute! Vintage Fair is starting soon! I had a chance to stop by early before opening and took this photo at the sim. This hair is from [elikatira] and comes in tons of different colors. I've been looking for a vintage style hair like this for a while so I was excited to see this! These shoes are from phedora which are also available at Vintage Fair which I'll be honest is a fairly new store to me but I love that you can change the color via hud to different parts of the shoe. I went with yellow to match my dress this time around. I have a new sponsor for my blog which I'm so excited about and honestly was in awe when they accepted me because I figured I had no chance of being picked! haha Cosmic Dust accepted me to their blogger team! YAY I've always admired the creations they come up with which fall right in line with my personal style and I'm excited to show you guys more of their items! This dress is from Cosmic Dust coming soon at Kustom9! I adore the style of it actually went really well with my Vintage feel I was going for. I choose the yellow/navy version but it comes in a ton of different color options! The fit is made for Slink bodies as well I'm wearing Maitreya in here and I was able to fit it pretty well too! Don't forget to check out Vintage Fair & Kustom9 both starting very soon!